Ben Beg is a seldom visited peak situated across the R336 to the north and east of the Maamturks range. 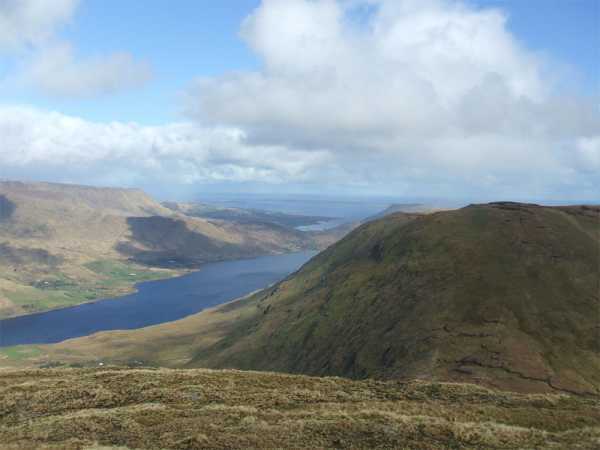 There are great views of both the Maamturks themselves and wider Connemara, as well the views north over Lough Nafooey and east over Lough Mask. The peak can be approached in a number of ways. Perhaps the most straightforward is an ascent from the Drishaghaun Valley; parking is difficult in the valley, but there are a couple of places at L97196 56996 A, and also at L9782 5684 B. From the first of these, cross the fence and contour west with a touch of north before reaching a river gully. Follow this gully northwest, contour around point 542 and head west to the summit, about an hour and a half of an ascent. A further option starts from Finny at around M003 594 C and takes in the entire and impressive ridge to the east of Ben Beg. Close to the Finny end of the ridge, on Bencorragh (not MV listed), there are examples of pillow lava, and other evidence of volcanic activity between here and Finny itself. From Finny to Ben Beg should take about 3 hours one way.